HRV and Strength Research: Implications for Strength/Power Athletes? At this point there is quite a bit of research pertaining to HRV and aerobic exercise/endurance training. However, the application of HRV for strength/power (S/P) athletes is less clear. Today I will discuss the available research pertaining to resistance training (RT) and HRV and share some of my thoughts on the topic. Unfortunately for S/P athletes, the majority of the research that exists involving RT and HRV do not involve athletes. Rather, most of the research tests the effects that RT has on resting HRV for the purposes of improving health/reducing mortality in elderly or diseased populations. Nevertheless, I will summarize what I’ve read. Heffernan and colleagues (2007) found no change in HRV following 6 weeks of RT and after 4 weeks of detraining in 25 year old male untrained subjects (n=14). Cooke and Carter (2005) saw non-significant increases in HRV following 8 weeks of RT compared to control in healthy young adults (n=22). In middle aged folks with pre-hypertension, aerobic exercise increased HRV while RT resulted in decreases in HRV (Collier et al. 2009). In healthy young adults aerobic training improved HRV (in men but not women) while RT had no effect (Sloan et al. 2009). Elite endurance athletes had higher HRV at rest compared to Elite power athletes but the power athletes had better resting HRV than control (Kaltsatou et al. 2011). No surprise here. Following 16 weeks of resistance training, a high intensity group and a low intensity group of healthy older women both improved strength with no significant changes in HRV (Forte et al. 2003). These results were consistent with findings by Madden et al (2006) with the same population however they included an aerobic training group who did see increases in HRV. RT improved HRV in women with fibromyalgia in a study by Figueroa et al. (2007) but failed to improve HRV in the same population in work by Kingsley et al. (2010). Compared to 3 months of low intensity training (calisthenics and breathing training), intense training (combined aerobic and strength training) improved HRV at rest and in response to orthostasis (standing) in COPD patients (Camillo et al. 2011). The researchers found that better baseline HRV, muscle force and daily levels of activity were predictors of HRV changes after exercise intervention. If one’s goal is to increase HRV via exercise then I would definitely go with aerobic work as this seems to be more effective than RT, though the results are conflicting. Training protocols, subjects, health status, age, HRV measurement position and duration, etc. all vary quite a bit which likely accounts for the conflicting results. I assume that there is a volume/intensity threshold that must be met during RT periods to cause a change in resting HRV. For optimal health it is likely that a combination of aerobic work and RT will offer the most benefits. From personal experience, I see much higher scores when I incorporate more aerobic or intermittent conditioning work. In reviewing my all time HRV trend, I can clearly see that over the spring and summer (03-09) of 2012 I had considerably more green scores and higher deflections. This is in line with the time that the weather got nicer and I started doing 30-40 minute runs 3-4x/week (March was unusually warm last year). 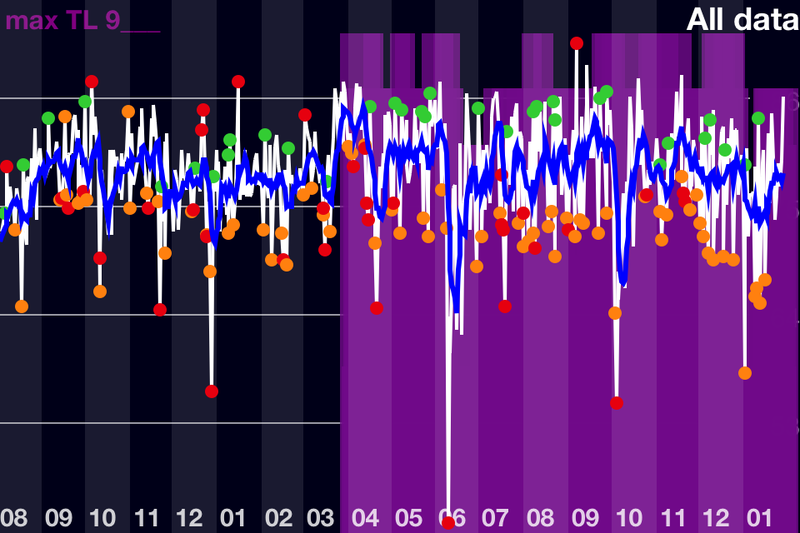 I got really sick for 2 weeks in June as I discussed here, otherwise I would expect my trend to be even higher. Once Sept. rolled around I started working full-time again and reduced my aerobic work to 2x/week for about 2o minutes and at a lower intensity at which point baseline declines back to pre-spring/summer levels. – Higher HRV at baseline results in improvements in aerobic performance (see here). Would higher baseline HRV result in better S/P improvements? If so, would purposeful manipulation of ANS prior to intensive RT periods via “aerobic” (read “work capacity”) training be of benefit? We already know the importance of GPP but is this relationship mirrored in HRV? If so, HRV may be worth monitoring during these periods. – Better basketball and ice hockey performance as well as endurance performance has been correlated with HRV (specifically parasympathetic tone) as I’ve discussed in previous posts. I’m not sure this relationship exists with S/P athletes but it would still be worth testing. Anecdotally, I’ve experience reduced strength performance when HRV is low due to physical fatigue. However, I haven’t really seen strength affected when HRV is low caused by other factors (sleep, other stressors, etc.) Therefore, establishing this relationship must involve careful consideration of these variables. – Does overreaching in S/P athletes result in a concomitant decrease in performance and HRV? Elite female wrestlers were considered non-functionally overreached when performance decreased and HRV was significantly above or below baseline for greater than 2 weeks. Elite tennis players saw significant decreases in HRV but improved performance. Generally in endurance athletes, overreaching will result in decreased performance and a significant increase or decrease in HRV (from baseline). – I feel that in S/P athletes, performance probably won’t decrease concurrently with HRV assuming it is a gradual decline as a result progressively increasing training loads. Rather, HRV will probably change first indicating an accumulation of fatigue and performance will fall at some point after if loading persists. Monitoring HRV may be useful to prevent excessive fatigue/overreaching if that isn’t the goal. Perhaps it is also useful in detecting transitions from functional to non-functional overreaching (the point at which HRV changes from overly sympathetic to highly parasympathetic). – Does the return to baseline HRV (after overreaching) happen concurrently with return or increase in S/P performance? This was the for case elite swimmers as peak performance occurred concurrently with peak HF values (parasympathetic tone). If so HRV would be a good tool for guiding tapers and establishing best protocols for meet/competition preparation. – HRV is an effective tool for guiding aerobic training. Does this apply to S/P athletes? Given that HRV reflects recovery status in S/P athletes (both in the research and anecdotally) and that HRV is sensitive to pretty much all forms of stress, it would seem logical to at least consider HRV in determining daily training. HRV may serve as a guide for determining training frequency and intensity/volume based on individual recovery. More on this topic here. It would be interesting to see HRV guided vs. Pre-planned RT compared in S/P athletes. – HRV will decrease in response to an intense workout. When you perform that workout again and again, your body adapts. The workout is no longer as stressful (decrease in soreness, lack of HRV response, quick recovery, etc. What benefits can HRV offer for adjusting volumes, intensities, exercise selections, frequencies etc. in effort to continually stimulate progress? Is HRV response after a workout any indication of how effective that workout is? Of course there are other factors to consider, not just the amount of stress/fatigue a workout causes. I have repeated workouts with high perceived exertion that have had little effect on HRV. Does that indicate that a change is needed in programming? It goes without saying that several other factors and variables should be considered when analyzing HRV. HRV is only one variable and is sensitive to a variety of factors that can influence a result (non-training related stressors, pre-competition anxiety, etc.). This March I will be relocating to Alabama to work in the Human Performance Lab at Auburn University (Montgomery campus) with Dr. Mike Esco. I met Dr. Esco at the NSCA National Conference in RI last summer. Dr. Esco has been researching HRV for several years now. We have several projects tentatively planned and doing an HRV and RT study is one that we’ve been considering. Hopefully we can make it happen. This entry was posted in Heart Rate Variability and tagged athletes, heart rate variability, HRV, programming, research, strength. Bookmark the permalink.